America has been fortunate. Assaults on our nation on the scale of the September 11, 2001 terrorist attacks have been rare. With few exceptions, the United States has not suffered at the hands of a military invader since the War of 1812 with Great Britain. One of the exceptions occurred in Alaska during World War II, when the Japanese invaded and captured some of the Aleutian Islands. 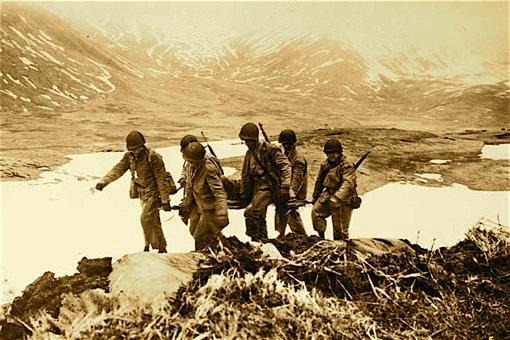 Men carrying a litter when American troops landed on Attu, Aleutian Island, May 11, 1943. UAF-1970-11-32, San Francisco Call-Bulletin, Aleutian Islands Photographs, University of Alaska Fairbanks Archives. Tensions had run high between Japan and the United States in 1940 and 1941. America prepared for war, and in Alaska that meant inserting troops and building defenses. After the December 1941 attack on Pearl Harbor, Alaskans and Americans along the West Coast worried that the Japanese fleet, somewhere in the vast Pacific, would unleash another surprise attack on their homes. And in June 1942 that fear became reality in Alaska. Within a few days, the Japanese bombed Dutch Harbor and occupied Kiska Island, in the western Aleutians. The Nichols family lived out the tense early days of the war at Kodiak. Vernon Nichols, an unemployed carpenter in his mid 40s, shipped to Kodiak out of Seattle in April 1941. He worked for a private construction company under contract to build a Navy base on the island. For a home on the island, he built a one-room shanty on a hillside between town and the base south of the community. His wife, Ruth, and their children, Gary 7 and Nancy 5, steamed north on the SS Baranoff in November, arriving in Kodiak on December 5, just two days before Pearl Harbor. Vernon’s job lasted just a year. After a couple month’s delay necessitated by concerns over Japanese action in the area, the family relocated to Anchorage in June 1942, where Vernon got carpentry work at Fort Richardson. I know you must have had an anxious wait while we were marooned at Kodiak. For almost four weeks we were on alert because the Jap fleet was on its way to the Aleutians . . . . There was no radio broadcast at Kodiak, no air mail, and no ships of any kind either, in or out. I am going to tell you about the last weeks we were there, as it is old news now and I don’t think the censors will blot it out. I think I told you, we were living on a hillside above a dock. Well the dock was bought by the Army while we were there and the area around it became a military reservation, with barbed wire entanglements and guards and so on, right within a stone’s throw of our back door. Previous to this, at the outbreak of the war, two soldiers from an anti-aircraft battery were stationed just below us. They had a cabin, and as they were our nearest neighbors, we got quite well acquainted with several of them, as they changed boys every few days. So you see, we knew about it every time there was an alert and there were plenty of them. A lot of them were to keep the soldiers on their toes, of course, but often there were unidentified planes or ships sighted and they would be on the alert until radio communications was established with them. After the first and only air raid alarm shortly after we arrived in December, we lived all winter very quietly except for one alert in February. It was in the forenoon and I noticed the boys below us out with their scope and telephone and knew they were on an alert, but it was quite a little later that I happened to open the door and saw a trench about a hundred feet away full of soldiers with rifles and machine guns. Then I began to look around and saw the whole hillside full of soldiers and some were busily setting up guns on the road above the house. Then one of our soldier neighbors came up and told Nancy and I to stay in the house, so I knew they really meant business. There had been no air raid alarm but I got our things ready, so we could leave in a hurry, if necessary. Nothing happened, however, and in an hour all the soldiers, but our neighbor boys, were gone. That time, two ships had slipped into the mouth of the harbor without being observed and until they found out who they were, they were prepared for whatever might happen. I was a bit uneasy after that about our evacuation plan. I couldn’t help but imagine how it would be with all that artillery around us and trucks crowding the road, so I was relieved when the Governor Gruening paid Kodiak a visit and, after learning of their plans for evacuation, promptly ordered that they be abandoned and everyone build slit trenches in their backyards for shelter. One or two of the neighbor women and I had already decided, we’d rather hold up in caves in the cliffs, than go on a bus to our evacuation destination. 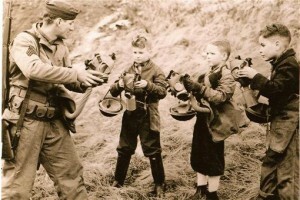 A serviceman shows three youngsters how to put on a gas mask, Kodiak, Alaska, December 1942. P-713-1, Wilken Collection, Kodiak Historical Society. Vernon made us a trench back of the house under some bushes. It had a spring of water in the bottom of it. We didn’t have to use it, of course, but there was a time, shortly before we left and after the bombing of Dutch Harbor, that we certainly expected to. That morning, Vernon was home with a bad cold. When I first got up, one of the soldiers called to me and said for us to prepare for a raid, as word had come from headquarters that Jap planes were heading our way and could be expected in two hours. So I got everyone up and we had breakfast and then I fixed some emergency food and the children and I put some dry boards in the bottom of our trench and I got canvas and blankets to make it comfortable. After that, I found I was going to the window about every minute or so to scan the skies for planes, so I decided to clean house and do some baking, just as though nothing was going to happen. The Japs didn’t show up and I was all to the good with some good food and a nice clean house when the alert was over. It was only about 24 hours after that, that our three week alert was over. The Japanese fleet had been beaten at Midway and we were safe, we thought. In a few days boats were arriving, and when the first one came to Kodiak we hustled around and got our freight down to the dock and closed our deal for the sale of the shanty and spent the last night of our stay in Kodiak, in a room in town. So many men were leaving, we were lucky to have a place to stay. A lot of them slept in the streets that night. The next morning we went to the restaurant for breakfast, then for a little hike to pass the time.
. . . As we went through town we saw a bulletin on the steamship company windows, saying our boat was in and would be sailing at 3:00, so we had to hurry and get our lunch and go on board. The minister’s wife and another friend, with whom I was quite well acquainted, came down to see us off. It is so different for us here [Anchorage]. We are away from the military sights except for an airplane once in a while and now and then a truck. The day we left our house in Kodiak we watched them setting up a big anti-aircraft gun within a hundred feet of our house. I told the boys, I was very glad to be leaving, as I didn’t want to even see them fire it in practice. There was one on the hill back of our house, that was always going off and making us jump. We often watched them at target practice. A plane would fly around with a target on a long rope trailing behind, and the guns, in several different positions, would take their turns firing at the target. Also, got to see an anti-aircraft drill on one of the transports, as it lay below us at the dock. I’m sorry that Mama worries over us so. She never writes that she doesn’t beg us to come home. If she could only know how it really is. Alaska is so big, very few realize that. We are 1700 miles from Attu and Kiska and the Japs have been shooting much closer to you at Astoria and in B.C., than they ever were to us, even at Dutch Harbor. Dutch Harbor is about 800 miles from Kodiak. There are lots of places to go here, if they ever get this far, just as there are in the States. Quite a lot of the families, who evacuated last winter, are coming back. It is very hard to get men with families to stay here and work, unless they can have their families with them. The AHS thanks Gary Nichols and Nancy Nichols Demmitt for permission to publish the letter.